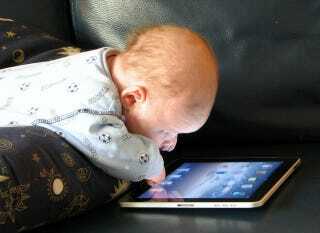 Kids and iPads are a better fit than you'd think—as long as those little hands are clean. Thanks to a batch of free games, storybooks and teaching tools, the iPad can be a great tool for brightening a child's mind. And, unlike the iPad, a raft of great kids' apps are cheap. So whether you've got a young child, a niece, a nephew or some other mischief-maker in need of a little iPre-School, we've got a batch of App recommendations—that teach everything from the alphabet, spelling, numbers, art and music—most under $3. There are a lot of apps that are vying for your attention (and your child's) so we're going to highlight a few of the gems so you don't need to sift through iTunes to find the best ones. The most important thing for a child learning the alphabet, I'd imagine, is consistent interaction. (I'd love to be authoritative on the subject, but it's been awhile since I learned my ABC's.) These alphabet-centric apps are designed to let kids play with letters, while having them explained and used in context to enhance understanding. ABC Expedition ($2.99) ABC Expedition is essentially an interactive alphabet book for your iPad. Your child clicks on a letter, and they get to see a zoo-themed example and listen to the word. There are also narrated direction telling you where to press for more animals, letters, etc. The fact that the app encourages independent play helps to put it above similar apps. Toddler Alphabet ($1.99) Toddler Alphabet gives you plenty of bang for your buck, with a diverse set of alphabet experiences. the app has alphabet blocks, alphabet games, and even sings the alphabet. It's pretty easy to concoct counting exercises for little kids. Count the cars. Count the dice. Count the fuzzy dice in people's cars. You get the idea. There will be times, however, when children aren't interested in cars, dice or whatever is out there in the world, so you can think of these apps as your ace in the hole. They'll keep your kid counting regardless of their surroundings. That said, if you're really strapped for ideas, you can always ask your child to count the number of apps in this article. Toddler 123 ($1.99) Part of the same series as Toddler Alphabet, Toddler 123 is a similarly comprehensive study of the numbers one through 10. Like Toddler Alphabet, 123 uses a set of activities to provide a diverse set of learning experiences revolving around the basics of counting, including learning how use, say and write each number. Counting for Kids ($0.99) This app is essentially a very cute, zoo-themed numbers quiz for kids. The game consists of ten random questions, each one will show some animals and ask: "How many Zebras are there? ", with a set of potential answers below. Now, this is a little close to drilling for my taste, but if tracking your child's progress with the app is essential to you, then this app works great because it does by presenting your score. Once a child knows his or her 123s, they might as well put them to good use. Math apps are spread out across a whole spectrum ranging from simple addition and subtraction to college-level calculus and beyond. We're be focussed on the very young end of the spectrum. Math Pets! ($3.99) Math Pets! addresses the whole set of introductory math skills including addition, subtraction multiplication and division. There are five different games, which can each be tailored to any discipline. Plus, kids can make their own custom creatures to play along with using a surprisingly deep set of creator tools. Math Party ($0.99) So the idea of this article was to give kids something to do when no one else is around. Technically,Math Party fails in that regard, because it is meant to be played with two people. For that reason, however, it's a rare math-based game experience. The goal of the game is to click the circles based on the numbers inside from least to greatest. Depending on the level, the numbers inside will be equations, rather than individual numbers. There actually is a single-player mode, but multiplayer educational games aren't that common on iOS, so that's what makes this one special. While helping kids build their academic backbone is important, we wouldn't want to do that at the cost of stunting their creativity, would we? Here are some drawing and painting apps specifically designed for kids to use with minimal adult aid. Paint Sparkles Draw (Free) This app is a very basic introduction to the world of art and coloring. Paint Sparkles Draw teaches children the name of the colors by repeating them whenever they're selected. Children can choose to paint freehand or using a coloring book-style image to color in. Though the app itself is free, themed coloring book sets are sold in-app for 99 cents a pop. Toddler Color ($1.99) Have we started to detect a pattern here? The fact that the Toddler series has been represented in every category so far speaks to its quality. Following the sam Toddler game format, Color teaches kids the names of the colors, while giving them free reign to draw as they please. Learning to Draw is fun HD ($1.99) This one is a slightly more advanced art education app. Rather than simply letting you free-draw or color, LtD actually teaches you how to draw things. The app breaks down 20 drawings into four steps, showing how each design can be broken into a set of shapes. Each step is accompanied by a template, so you can always refer back if there's any confusion. Of course, after you finish your drawing lesson, you're encouraged to color in your work and make it your own. If the kids already have the alphabet down, there are a lot of options for helping them transition to making fully-fledged words. The spelling genre is tough, because, as a category, it applies to such a wide spectrum of kids. Different kids need different levels of vocab and help. Though this article skews towards the kind of young kids who are just learning to spell for the first time, we've included a couple of extra entries for more advanced spelling as well. Abby Monkey 7+2 First Words ($1.99) Abby Monkey is a very nice first foray into the world of spelling. Simply choose a theme, and spell the words that go with each picture. There's not a whole lot to it as a game, but it makes up for that with its simplicity and ease of use. Shape-O ABC's ($1.99) Mixing arts and crafts with spelling, Shape-O asks kids to spell a word and make a picture to accompany it. Spell "tiger", for example, and then make one using geometric blocks. Any app that mixes disciplines gets high marks in my book, and in that way Shape-O sets itself apart. This app is very low-stress compared to some of the others on this list. While it is educational, the main purpose of the game is to have fun. My Spelling Test ($0.99) This app is not exactly a game. It is a spelling test generator. Put in the words you'd like to quiz on, record yourself saying each word, and you're done. The great thing about this app is that it works for all ages. You can stick to the simplest words, or you can use it for SAT prep. The app can also be set to send test results via email, allowing you to take a hands-off approach, while keeping abreast of your child's progress. Spell with Friends ($1.99) Spell with Friends is a straight spelling-bee prep. This app uses a flashcard format, includes the phonetic origin and definition and of each word, asks for each word to be used in a sentence, and includes words like "abattoir", which is probably above most pre-schoolers level. Still, the gentle bee with glasses tells me that, despite the decidedly adult vocab list, this app is meant for kids. On top of the usual spelling apps, which will help your child get the hang of making words and using them in context, the iPad is home to a whole slew of "enhanced" children's books. They've got classic books for kids with added animations, educational aspects and, of course, the ability to read itself. Many classic children's book series have been brought over to the iPad. Here are some of my favorites from when I was a kid, each with a few examples of their selection. The Fantastic Flying Books of Mr. Morris Lessmore ($4.99) You may not have heard of this one, but it is the iPad's most delightful interactive book, a children's story about a guy who loves rendered with wonderful interactive animations. I know the last thing the parent of a young child needs is another noisemaker, but the iPad can also be used to help introduce children to the world of music. As you'll see, these apps approach the way to introduce children to music in many different ways. If your child loves music, then there's a good chance that at least one these apps will be great for them. Moozart ($1.99) Moozart is an introduction to music theory for tots. This app shows kids the meaning of musical notes, as well as terms like sharp and flat. At its core, Moozart is music writing program - you can write a song and have it played back to you. On top of that, however, is a child-friendly farm animal theme, and the ability to learn children's songs like London Bridge and Old McDonald Had a Farm. Once your child gets the hang of the musical staff, they can make their own songs. In other words, there's a built-in progression that allows kids to take off their own training wheels as they become comfortable. Toddler Jukebox ($1.99) Toddler Jukebox is exactly what it sounds like. The app can play 12 classic children's songs like Wheels on the Bus and The Itsy Bitsy Spider. The key is that the app is very kid friendly, so many young kids can operate it themselves. Kinder Lyre (Free) Kinder Lyre is the program on this list that is closest to being an actual instrument. Technically it is an instrument. It's a digital lyre. Of course, the Kinder Lyre is locked in a pentatonic scale, which doesn't have sharps or flats, so there will be a lot of songs that you won't be able to play on it. According to developer babygames4.us, they locked the scale so that the sounds that come out of lyre will sound nice, regardless of how they're played. In other words, just turn this baby on and let the kid go nuts.